Located in the lush gardens of the Babylon Sauna and Spa complex are the stunning, modern BVLGARI garden suites. 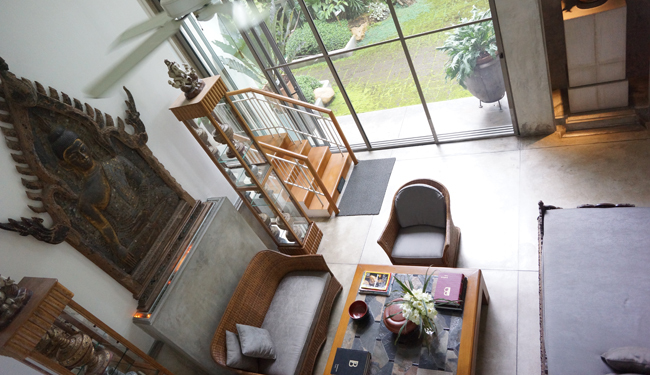 Beyond the main entrance to Babylon you pass into your private garden and into a split-level open atrium common living area decorated with stunning Asian art form the past and present. Each unity contains two or three self-contained suites and all are furnished with beautiful Burmese art deco furniture and have private bathrooms. Large marble, granite bathroom with walk-in showers in each suite, stocked with all amenities. Complimentary coffee, tea and snacks served in the shared lounge and common room 24 hours a day. Complimentary breakfast served on the 6th floor Babylon high-rise. Writing desk, seating and valuables safe. Beautiful private gardens with seating.